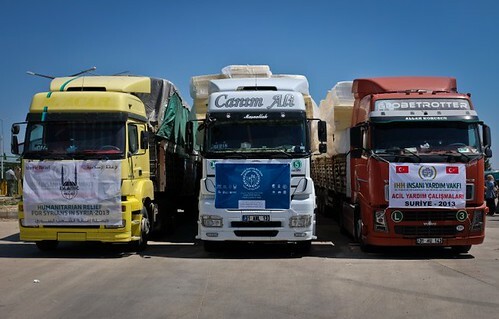 Photo of aid convoy by Christian Payne. READING AND LISTENING to stories from relief efforts destined for Syria reminds me of cargo I once carried for missionaries in Africa. But back then, there were no mortars firing a few miles away. In Audioboos and blog posts and photostreams, Christian Payne offers close-ups of a region wrecked by civil war. His heart-felt journaling led me to the Hayat for Syria donation page along with the hope that their convoys get through unmolested. As the father of a five-year old daughter, my heart cried while reading Christian meeting up with a young Syrian boy. "In the courtyard a five year old boy was being wheeled around by his father. They had both survived a rocket attack in Aleppo. But there are varying levels of survival. They both live with the loss of Sultan’s mother and sister. Sultan has the added loss of his left leg and genitalia. "I felt so weak in front of him. His story is one of thousands. Yet I feel the suffering of a child is impossible to dilute. I’m embarrassed to say I turned away to cry; I didn’t want him to see me with tears in my eyes." The story of Syria is far from finished. Yet the suffering of Syrian people seems to be papered over as mainstream media covers other events with much smaller numbers of lives lost. If you care to make a difference, I encourage you to visit the donations page and help supplies get through with a Hayat convoy for Syria. IBAN 0 0691 8436 7001. SWIFT CLIBLBBX. I know how precious supplies can enter logistics chains and be siphoned off before reaching remote areas. That doesn't happen with Hayat for Syria convoys because those lorries take direct routes into disputed areas, often without official Syrian government sanction. It's risky but effective. Bernie Goldbach in Cashel | Snap from Business Post magazine. I READ PAPER copies of newspapers during the weekends because it helps me see things from the perspective of a layout editor. It's an exercise with information architecture. Kathryn Thomas (pictured at her Audi gig) took a page in the Sunday Business Post Magazine and mused about how she might document her trip to Chernobyl with Adi Roche. I'd look no farther than how Christian Payne documents those kinds of trips. Actually, I'd get an Audi Estate with 100,000 miles on the clock to push off from Budapest to Kiev and then towards Chernobyl. I'd document the journey with Audioboo, Bambuser, Flickr and Instagram. I'd set up a Flattr campaign to encourage viewers to drop micropayments into a tip jar and I'd eat only what my Flattr money compensated. On a totally unrelated note, I'm experimenting with the format of my blog posts to see how media elements and horizontal rules affect Sound Gecko's text-to-speech processing. I don't expect anything beyond this sentence to be processed by Sound Gecko and that means a new Zemanta extension probably does not get harvested by Sound Gecko. There's more to the Business Post news below the fold. I made a short video about things that piqued my interest. 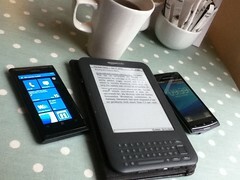 Bernie Goldbach in Clonmel with Kindle, Windows Phone and Android. I LIKE READING things on Kindle and on Nook, so word that Microsoft might actually buy Barnes & Noble's Nook business is good news to me. Microsoft needs a reading ecosystem for Surface tablets. I'd buy a Windows 8 touchscreen device if it had a robust reading ecosystem attached. 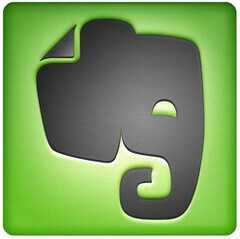 And the Nook ecosystem, with its book discovery and “scrapbooking” features, is quite strong. Plus Nook Media also has strong ebook publisher relationships that Microsoft might leverage too. I don't think Microsoft would outmuscle Amazon in the e-reader market but having Nook embedded into a Microsoft Surface tablet will help sell more of that product to existing Windows users worldwide. Bernie Goldbach teaches e-publishing at the Limerick School of Art and Design. Bernie Goldbach in LSAD-Clonmel using highly-recommended Artisteer. I NEED TO MAKE a series of responsive websites and have started Artisteer tutorials on the strong recommendation of my wife, the most productive designer I know. Ruth designs more web interfaces in a week than I create in a year. Her content management requirements create careful choices when attempting any sort of change in making a wireframe come to life. So when I said "responsive" and she said "Artisteer" I started downloading a 111 MB trial version of software that looks like it will help me accelerate to completion some of the templates I must produce for events, course offerings, community websites and blog sites. If you're reading my posts by RSS feed, you'll get a friendly nudge to view my blogging via a browser in June. I reckon it will take most of my spare time to engineer a few false starts with the Typepad content management system before I'll light up a major change in my Old Skool Blog. I plan to screenshot the process so others might share in the stuff I learn from Artisteer tutorials and from burrowing between the pages of a few books. 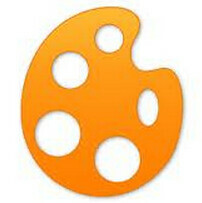 Designify -- "Top 10 Web Design Books to Help You With Your Projects", March 1, 2013. 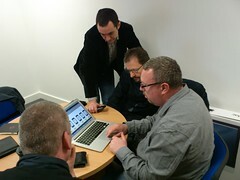 Bernie Goldbach teaches creative multimedia on the Clonmel campus of the Limerick School of Art and Design where responsive themes are core to the web development curriculum. Holding Maximo iP-HS3 iMetal headset for Lumia. 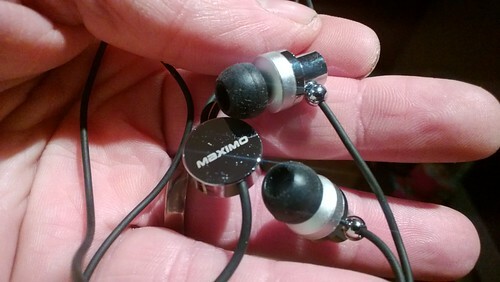 MAXIMO'S iMETAL headset provides high quality listening and recording results when connected to my Nokia Lumia 820. Unlike several earbuds I've purchased before, the iMetal headset works with iPhone (all the way back to 3G), Blackberry or any multimedia phone with a 3.5mm or 2.5mm headset jack. The iMetal's button control functions are dependent on the features of individual multimedia phones. Bernie Goldbach in Clonmel | Toaster by George Watson. I RESIST CONTEXTUALISING myself by work and by home. That's actually a big problem I need to solve. Clever productivity software now seeks a context for to-do items, often by automatically recording a physical location for a task that I set on a GTD timeline. But I also know that who I am and what I do often resists proper contextual descriptions. Part of that limitation arises because I work in creative space and that space is constantly evolving. 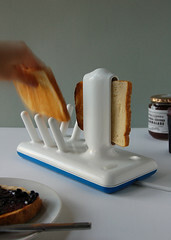 When creative designers like George Watson (he designed the toaster in the photo) put their minds to redefining objects and functions, you often get something minimalist or even skeletal. In my own work, some of those skeletal frameworks make my overall productivity look absent of meaningful results. And that has to change. 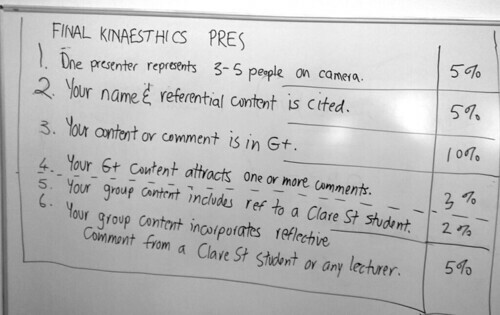 Whiteboard snapped in the Limerick School of Art and Design. I TEACH AT THE intersection of analogue and digital. Some of my whiteboard snaps prove the point. Photo of Dermot Daly with LSAD Students. ONE OF THE BEST ways to provide a quality check on an academic curriculum is to get expert industry opinion of it. Today, three creative multimedia students sat with Tapadoo's MD an got a leading edge opinion about their emerging skills as application developers. Dermot Daly set aside an hour in his office to meet with Ross Bolger, Patrick Broder and Edgaras Zvirblys. After a quick hands-on demonstration of a three-game children's education app, Dermot offered his judgment. You can hear what he thought in the audio clip below. Bernie Goldbach in Cashel | Knock-off battery from China. 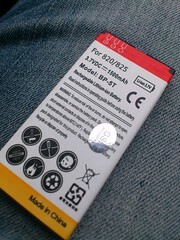 I LIKE HAVING a replaceable battery in my phone and that's one reason I opted for a Lumia 820. However, I've discovered that all batteries aren't built the same. In my case, an inexpensive 8 euro battery won't give me eight hours of hard use. However, the 1500 mAh rating on the Li-ion replacement is less than the 1650 mAh of the original Nokia BP-5T Li-polymer so I reckon I'm getting what I paid for. Batteries and microtechnology intrigue me. I'm worried about all the evil residue I'm leaving behind for future generations because of my disposable batteries so I try to buy the (much more expensive) rechargeable batteries for kids' toys and consumer electronic gear. I've also noticed a relationship between how long it takes to recharge a battery and how long that battery's duty cycle actually extends. And I'm seeing evidence of major leaps in microtechnology that might boost our expectations of battery power. Battery technology deserves to observe a breakthrough. Researchers at the University of Illinois might have just what we need--powerful microbatteries so strong that you might use one to jump start your car's flat battery. These lithium ion microbatteries are only a few millimeters in size. You could recharge your smartphone in less than a second with these microbatteries.